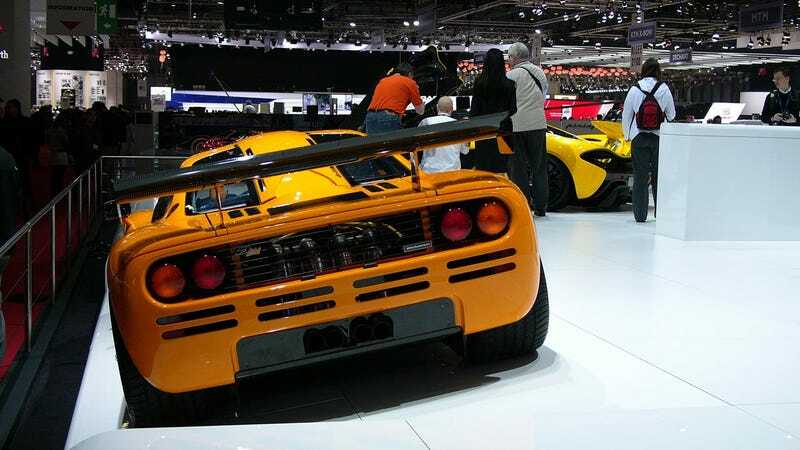 McLaren Did Bring An F1 To Geneva! Fretting all day yesterday that they were going to succumb to the corporate temptation to distance themselves from previous products, McLaren proved me wrong and themselves cool by bringing an F1 to Geneva, plopping it down next to the space-age but remarkably similar P1. It’s gloriously orange and if it weren’t for the computerized alien curves prevalent in contemporary supercar design it could pass for a brand new and spectacularly modern car. Good thing Lewis Hamilton is now McLaren’s prodigal son so they didn’t have to hand it to him yet to hoon around forever.